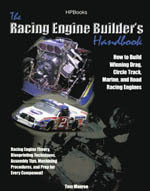 Covers the full spectrum of building a strong, reliable racing engine regardless of make. Details include how to choose, inspect, stress relieve, machine, fit and assemble all systems and components. Includes information on high performance coatings to reduce wear, stress relieving to increase strength, and modifications to maximize power and durability. Includes hundreds of photos, drawings and charts. Full of important tips from many top engine builders to help you build a consistent winner. 200 pages. Published in September 2006.